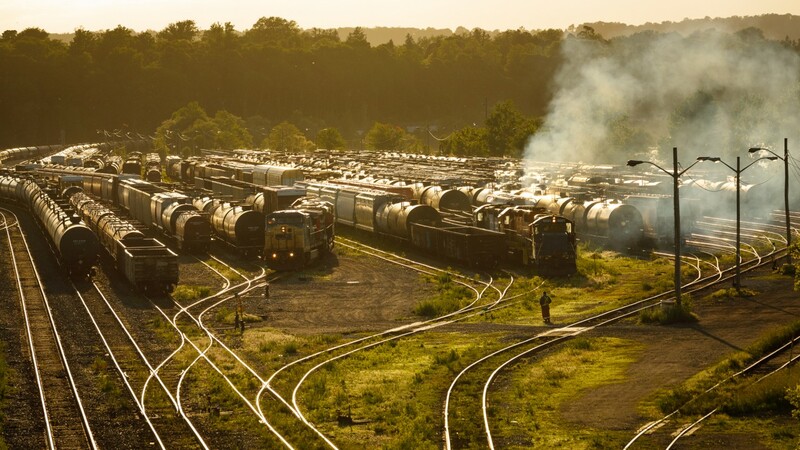 Railpictures.ca - Ryan Gaynor Photo: Evening Tones and Burnt Dino Bones A trio of EMDs fill the evening air with diesel exhaust as the sun sets over CN’s Stuart Street yard in Hamilton, Ontario. | Railpictures.ca – Canadian Railway Photography – photographie ferroviaire Canadienne. Caption: Evening Tones and Burnt Dino Bones A trio of EMDs fill the evening air with diesel exhaust as the sun sets over CN's Stuart Street yard in Hamilton, Ontario. This is gold; pun intended. Wonderful colour with the lighting here.